The selection of The Latvian State Centenary programme events is diverse and widely available for a variety of audiences all over the country - more than 2,000 events provide a rich and vibrant range in various fields to suit different tastes and interests. To effectively be able to choose the most relevant events from this range, the Ministry of Culture Office Latvia 100 presents a virtual quiz that allows you to try out your very own centenary event calendar as well as find out what kind of celebratory type you are - an inquisitive athlete, a business shark, or perhaps an intellectual culturalist? 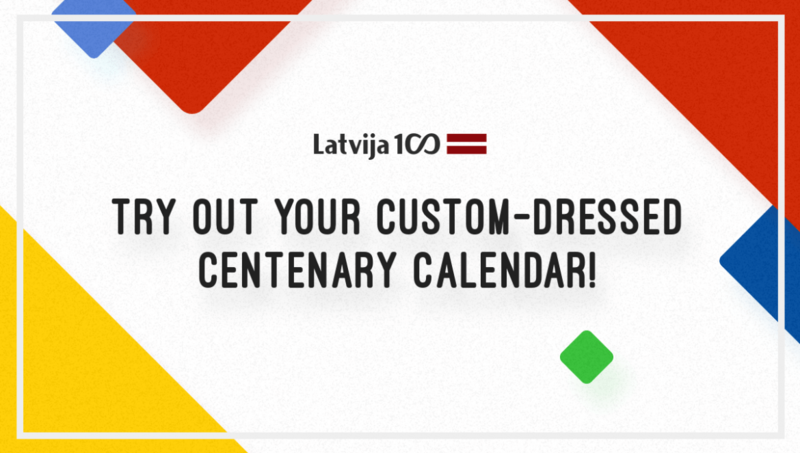 The Latvia 100 website has already published more than 2000 different events, therefore, the online centenary event "changing room" pielaiko.lv100.lv/en will diligently try to discern the interests of each celebrating individual and to match them with the most relevant program of events. The range of magnificent and abundant centenary events is not only made up of assorted cultural, but also educational events and projects for children, new tourism routes for families, various economic and scientific forums, events initiated by national and local authorities, and other projects involving the Latvian society. The ingenious digital solution not only informs and allows you to follow the latest monthly events, but also invites to do something good in honour of the centenary. Whether it's meeting up with your neighbours, learning about Latvia's nature or donating your unnecessary items - every well-meaning deed and intent reminds us that we are building our centenary ourselves in our everyday actions, and every moment. The Latvian State Centenary programme is the grandest and most far-reaching series of events in the history of modern Latvia. The occasion will be marked by thousands of diverse events taking place all over Latvia and in 70 countries around the world.